4 year old Willie McLennan invented this, according to Ian James. Great for pike, bass, and more. "Created by Willie McLennan, age 4, in 1993, this is a great fly for bass, carp, drum and redhorse. He noticed when hooked smallies regurgitated food, other fish would scoop it up. 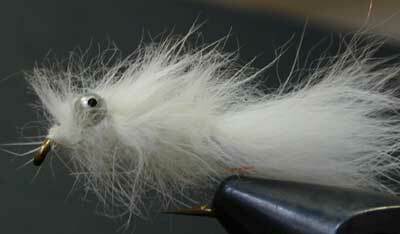 His first fly was made from white marabou, but we changed it to rabbit fur for durability. A lot of folk say they invented this, but Willie tied the first one. Larger sizes are good for pike and lake carp."